With [title of show] completing the journey from Off-Broadway to Broadway this week, The Rodgers & Hammerstein Organization is proud to announce that it has acquired the stock and amateur rights to this hit musical written by Jeff Bowen (music and lyrics), and Hunter Bell (book). In addition to licensing the musical through R&H Theatricals, the Organization will represent Bowen’s score through its music publishing division, Williamson Music. [title of show] is a musical by two guys named Jeff and Hunter about a musical by two guys named Jeff and Hunter. Its very specificity gives [title of show] broad appeal, as it takes a thoroughly unique and comical look at the pleasures and perils of the artistic process. After an acclaimed run at the Vineyard Theater Off-Broadway in 2006, and the release of an Original Cast Album that same year, an even larger audience was cultivated through the enormously popular web series, the [title of show] show. As diehard fans of the web series were the first to learn, the musical with Broadway aspirations reaches Broadway this week, with performances beginning at the Lyceum Theater on Saturday, July 5, prior to opening officially on July 17. With a Broadway premiere in the works, and a Broadway cast album on the way, Williamson Music is developing a song book that will reflect the latest incarnation of the snake-eating-tail brilliance that is [title of show]. The demand for sheet music to individual songs from the score, including “Part Of It All,” “A Way Back To Then,” and “Secondary Characters,” has been tremendous, and Williamson Music is eager to get the songbook out as quickly as possible. Though the stock and amateur performance rights are not yet available, R&H Theatricals looks forward to licensing [title of show] across the globe to theatres big and small. R&H's new state‑of‑the‑art website (www.rnh.com) will be the first place to break the exciting news when rights become available. For more on [title of show] and its authors, visit the R&H website pages for[title of show], and Jeff Bowen, and Hunter Bell. The official website for [title of show] is www.titleofshow.com. JEFF BOWEN wrote the music and lyrics and co stars in the Broadway bound [title of show], beginning previews July 5 at the Lyceum Theatre. He was awarded an OBIE for his work on [title of show], and has composed music for several shows at PS 122, including AVANT GARDE A RAMA IN SPARKLEVISION and HELLO, MY NAME IS AVANT GARDE A RAMA. Also, SPARKLEFEST 2000 at Dixon Place, THE A TRAIN PLAYS and the film Boat Mime. His onstage credits include THE WHO'S TOMMY, THE DIVINERS, THE DOCTOR IN SPITE OF HIMSELF, OF THEE I SING, THE SANDBOX and ON THE TWENTIETH CENTURY, among others. Jeff is a proud member of the National Audubon Society and the American Birding Association. Hunter Bell wrote the book and co stars in [title of show], set to begin previews July 5 at the Lyceum Theatre. He received an OBIE Award and a Drama League nomination for [title of show]. Writing credits include, SILENCE! THE MUSICAL (book writer/Overall Excellence Award—Outstanding Musical 2005 Fringe NYC). STUCK BY EPCOT (playwright/Manhattan Theatre Source), A TRAIN PLAYS (lyricist/Neighborhood Playhouse), Ringling Bros. and Barnum & Bailey Circus (writer 2007 Circus). He contributed material for Counts Media Inc.'s interactive billboard project, was a 2003 finalist in Warner Bros. Television Comedy Writers Workshop, and has developed new works at the Dramatist Guild, Irish Rep, PS 122, Goodspeed/Chester, CanStage, MTC, Ars Nova, and the O'Neill Center. As an actor, Hunter made his Broadway debut in HOW THE GRINCH STOLE CHRISTMAS. He appeared in TAMING OF THE SHREW, ...FORUM, GYPSY (St. Louis Rep), SHE LOVES ME, THE MOST HAPPY FELLA (Cincinnati Playhouse), ANYTHING GOES (Great Lakes Theatre Festival), GODSPELL (MUNY), LITTLE ME (North Shore), THE TEMPEST (Dallas Shakespeare Festival), SIDE SHOW (Cleveland Playhouse), ROMEO AND JULIET, THE BOYS FROM SYRACUSE (Alliance Theatre), JUMBO, OH, BOY! (York), SOUTH PACIFIC (Carnegie Hall), THE LAST NIGHT OF BALLYHOO (Coconut Grove), RAGS (Paper Mill), PROMISES, PROMISES (Stages), ME AND MY GIRL (Goodspeed Opera House, CT: Outer Critics Award— Best Actor in a Musical). TV: Out of the Box (Disney Channel), Guiding Light. BFA Webster University. A music publishing company founded by and for writers, Williamson Music was established in 1944 by the legendary duo of Richard Rodgers and Oscar Hammerstein II (both sons of men named William). Today, Williamson Music (ASCAP) and R&H Music (BMI) represent the catalogues of Richard Rodgers, Oscar Hammerstein II, Lorenz Hart, Irving Berlin and T. S. Eliot, among others. Equally committed to contemporary talent, their roster also includes: Gary Adler, John Bucchino, Ann Hampton Callaway, Joe DiPietro, Scott Frankel, Ricky Ian Gordon, Adam Guettel, Sheldon Harnick, Michael Korie, Henry Krieger, Robert Lopez, Jeff Marx, Lin-Manuel Miranda, Jimmy Roberts, Stephen Schwartz, Charles Strouse, Michael Patrick Walker, Bob Walton, Jim Walton, and David Zippel. Maxyne Lang has been President of Williamson Music since it was brought into The Rodgers & Hammerstein Organization in 1988. 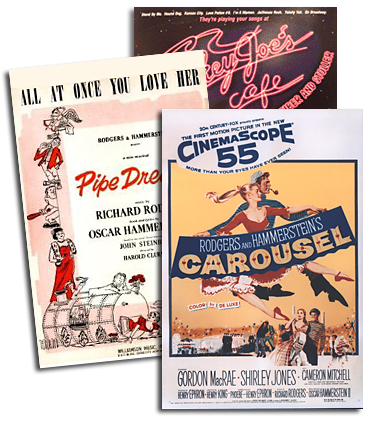 Formerly known as The Rodgers & Hammerstein Theatre Library, R&H Theatricals represents the stock and amateur stage rights to over 100 musicals by more than 200 writers. In addition to the works of Rodgers & Hammerstein (including OKLAHOMA!, SOUTH PACIFIC, and THE SOUND OF MUSIC), Rodgers & Hart (PAL JOEY, BABES IN ARMS), and Kern & Hammerstein (SHOW BOAT, MUSIC IN THE AIR), R&H also represents musicals by Irving Berlin (ANNIE GET YOUR GUN, WHITE CHRISTMAS), Andrew Lloyd Webber (CATS, JOSEPH...), Adam Guettel (THE LIGHT IN THE PIAZZA, FLOYDCOLLINS), Kurt Weill (THE THREEPENNY OPERA, LADY IN THE DARK), such perennials as BIG RIVER, ONCE UPON A MATTRESS, andFOOTLOOSE, and the longest-running revues in the history of Broadway—SMOKEY JOE’S CAFE—and Off-Broadway—I LOVE YOU, YOU’RE PERFECT, NOW CHANGE. Recent acquisitions include REEFER MADNESS, ALTAR BOYZ, BERNARDA ALBA, MID-LIFE! THE CRISIS MUSICAL, and BRIGHT LIGHTS, BIG CITY. Charlie Scatamacchia is Vice President for R&H Theatricals.